Hyper Cutter Prevents the Attack stat from being lowered. This Pokemon cannot have its Attack lowered. 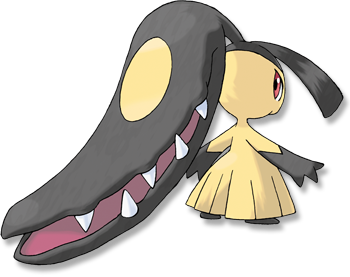 Sheer Force* This Pok�mon's moves with extra effects have 1.3x� their power, but their effect chances are reduced to 0. Leaf Green It uses its docile-looking face to lull foes into complacency, then bites with its huge, relentless jaws. Diamond/Pearl Attached to its head is a huge set of jaws formed by horns. It can chew through iron beams. Platinum Attached to its head is a huge set of jaws formed by horns. It can chew through iron beams. Heart Gold It chomps with its gaping mouth. Its huge jaws are actually steel horns that have been transformed. Soul Silver It chomps with its gaping mouth. Its huge jaws are actually steel horns that have been transformed. Black Attached to its head is a huge set of jaws formed by horns. It can chew through iron beams. White Attached to its head is a huge set of jaws formed by horns. It can chew through iron beams.